If you wish to send correspondence to Bob Grove or Grove Enterprises, please use the physical address of 618 Dog Branch Road, Brasstown, NC 28902. Thank you! 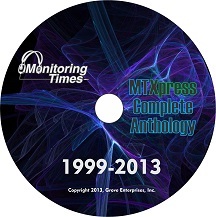 If your subscription to Monitoring Times extends beyond December, 2013 and you would like to request a refund for the balance, please contact us atorder@grove-ent.com. Bob Grove’s Antenna Series for FREE!